SOUTH EAST REGION CONSERVATION ALLIANCE INC. External links to other websites worked at time of publication. The natural world can help save us from climate catastrophe. George Monbiot. The Guardian. 03.04.2019. What does the future hold for our native forests? Nightlife: featuring Australia's native forests. Philip Clark. ABC. 50mins 37secs. 03.04.2019. There are estimates that native forests cover about 19 percent of Australia's land mass. Aside from providing a resource for the timber industry, native forests also help provide water, a home for native species, a destination for tourists, and operate as a carbon storage. So what's their future? Professor David Lindenmayer, a Forest Ecologist with the Fenner School of the Environmental at the Australian National University, also an Australian Research Council Laureate Fellow; and by Joe Fontaine, an ecologist and Lecturer in Environmental Science at Murdoch University joined Nightlife to look into that question. Record numbers of Australia's wildlife species face 'imminent extinction'. Fauna crisis highlights the failure of regional forest agreements. Wilderness Society. Helen Davidson. The Guardian. 31.03.2019. The Berejiklian Government’s failing environmental record. Kate Smolski, Independent Australia. 22.03.2019. It's time to stop logging our native forests. Elizabeth Walton, Independent Australia. 04.03.2019. Listen to Peter Robertson, National Campaigner for the Wilderness Society talk about the Forest Embassy on 2SER 107.3. 02.2019. STATEWIDE MEDIA COVERAGE OF THE NATIONAL FOREST UPRISING. The Forest Embassy Canberra Rally. 13.02.2019. Social license chipped away. Why support for woodchipping has collapsed in south east NSW. Principal author: Harriett Swift, SERCA. | Photos © David Gallan, President, NPA Far South Coast. 02.2019. The Biomass Delusion: Position Statement on Forest Biomass Energy. Environmental Paper Network. Endorsed by SERCA and SERCA member groups: South East Forest Rescue, Great Southern Forest, Forest Media, Friends of the Forest, mid South coast NSW, and many other Australian environmental organisations. As at 18.01.2019. Native forest logging support low in regional Australia, leaked report shows. ABC Gippsland By Emma Field. 10.12.2018. Nasty new logging rules. 3CR Community Radio. Corunna Forest Protection Group. 02.12.2018. A disaster. Forest deals reignite tension between loggers and conservationists. Nicola Hasham. The Age. Brisbane Times. WAtoday. Sydney Morning Herald. 17.11.2018. 'A disaster': Forest deals reignite tension between loggers and conservationists. Nicola Hasham, Canberra Times, 16.11.2018. Capture the carbon here at Corunna say anti-logging protesters. Duncan McLaughlin. Narooma News. 12.11.2018. The ‘Last Stand’ for Corunna State Forest near Narooma. Ian Campbell. About Regional. 09.11.2018. Letter: stop logging public native forests to avoid global warming. Dalian Pugh. Gazette. 09.10.2018. Visiting coast’s natural beauty. Bega District News. 27.08.2018. Protecting Australian forests is a win for all.. Dr John Van Der Kallen. Daily Libeeral. 29.06.2018. Proposed NSW logging laws value timber over environmental protection. Dr Oisín Sweeney, Senior Ecologist, NPA NSW. The Conversation. 19.06.2018. Contrary to common belief, some forests get more fire-resistant with age. Philip Zylstra. UoW. The Conversation. 17.04.2018. Tasmanian regional forest agreement delivers $1.3bn losses in ‘giant fraud’ on taxpayers. Forestry Tasmania’s total cash losses were $454m over 20 years, with a write-down of $751m in value of forest estate. John Lawrence. The Guardian. 29.03.2018. Labor vows 'full scientific assessment' of logging agreements. Greg Borschmann. The Guardian. 29.03.2018. Coalition accuses green groups of misleading public on forestry agreements. The Guardian. Greg Borschman. 23.03.2018. Native forest protections are deeply flawed, yet may be in place for another 20 years. Professor David Lindenmayer, ANU. The Conversation. 23.03.2018. NSW Labor refuses to approve forestry agreements based on 'out-of-date' science. The Guardian. Greg Borschmann. 22.03.2018. Australia highly vulnerable to climate change: HSBC. Global Warming. Cole Latimer. 22.03.2018. Ministerial documents reveal Commonwealth concerns about 'old science' and 'validity' of forest agreements. ABC RN. Gregg Borschmann. 21.03.2018. Exclusive: legal concerns over plan to roll over forestry agreements without reviews. Greg Borschmann. TheGuardian. 21.03.2018. The fact that climate change denial can survive has a direct causal relationship with mathematical illiteracy. Australian Eddie Woo, one of the top ten maths teachers in the world. SMH. 19.03.2018. After 20 years of uneasy peace, the forest wars are back. The Guardian. Greg Borschmann. 20.03.2018. Department of Primary Industries close public submissions on Regional Forest Agreements. Bega District News. 14.03.2018. 'Global deforestation hotspot': 3m hectares of Australian forest to be lost in 15 years. Michael Slezak. The Guardian. 05.03.2018. Regional forest campaigners say consultations a sham. The Beagle. 20.01.2018. Government infighting over old growth forest logging revealed in 1995 cabinet papers. The Guarian. 01.01.2018. ABC repeating its false claim that koalas are not at risk without allowing acknowledged experts the right of reply? No right of reply for koalas: ABC repeats The Australian's junk science. Sue Arnold. Independent Australia. 07.12.2017. Content from Great Southern Forest mentioned. Wonboyn Lake landowner Don Ross is concerned for the environment. Zach Hubber. Magnet. 12.10.2017. Tensions over a sustainable timber industry amid claims koala habitats getting smashed. Dom Vukovic. ABC News. 12.10.2017. Money can’t buy me love, but you can put a price on a tree. Heather Keith, David Lindenmayer, Michael Vardon, ANU. The Conversation. 11.10.2017. South West old growth forests 'redefined' to allow more logging. David Allan-Petale. WA Today. 09.10.2017. An End to Logging at Dunns Creek Heralds World Animal Day. The Beagle. 04.10.2017. Land clearing in NSW. Wix.com. 23.09.2017. Three unique spotted gums identified within logging compartments nominated with National Trust. The Beagle. 18.09.2017. Greater Gliders found in heart of logging operation at Mogo State Forest. The Beagle. 20.07.2017. Mid term Report Card of coalition Government on the Environment. Nature Conservation Council. 03.2017. Analysis Mid Term Report card of coalition Government on the environment. Nature Conservation Council. 03.2017. Focused on future of native forests. Merimbula News. 14.02.2017. Koalas are at the centre of a perfect storm. The species is slipping away. Kevin Evans. The Guardian. 16.01.2017. 2016 State of the South East Forest Report. The Nature Conservation Council of NSW endorses the Great Southern Forest proposal for the NSW and Federal Governments. See extract of Minutes. 22-23 Oct 2016. Tantawangalo illegal logging claims denied; EPA to investigate. Bega District News. 24.11.2018. Burning ambition: Why the forestry industry needs the RET. Lorraine Bower. 05.06.2016. Abolish Failed Forest Deals - Regional Forest Agreements Should End When They Expire if Not Before. Authorised by M. Blakers with various signatories. May, 2016. Murrah Flora Reserves Protect Koalas, But At What Cost? Published in National Parks Association Winter edition of Nature NSW, 2016. Dr Bronte Somerset. 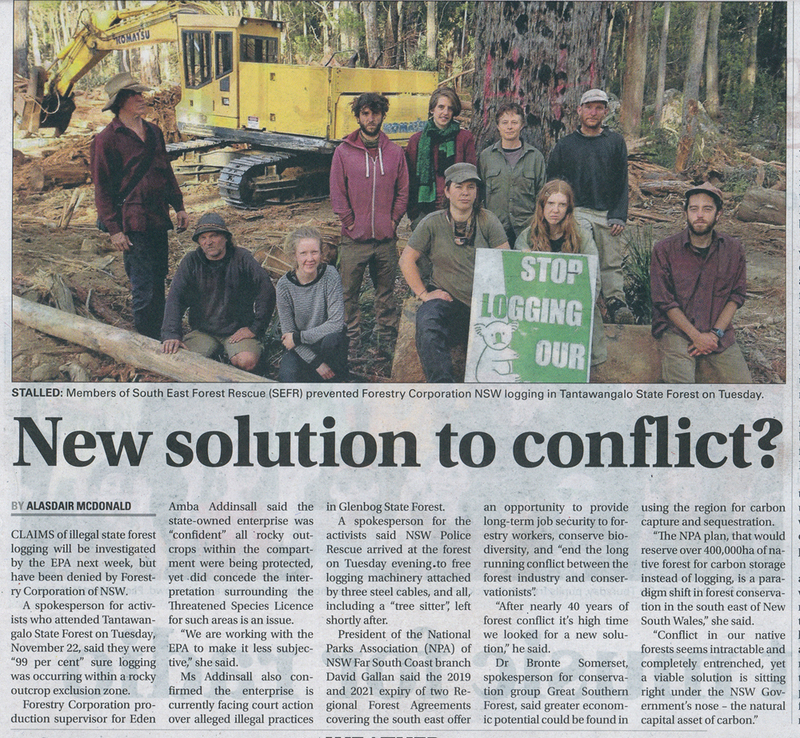 Logging conflict brewing again in NSW south east forests. ABC South East NSW By Bill Brown. 16.03.2016. New flora reserves formed to save remaining south-east New South Wales koalas. Bill Brown. Harriett Swift. Chris Allen. ABC South East. 01.03.2016. Scientists, local conservationist oppose burning forests Narooma News. 29.06.2015. Eastern Australia listed as global front for deforestation.World Wildlife Fund. 28.04.2015. Richard Flanagan 'ashamed to be Australian' over environmental policies. The Guardian. 15.10.2014. NSW taxpayers gain from logging halt Staff reporter. Climate Carbon markets. Science and Environment. 09.07.2013. Australian Government response to the Climate Change Authority’s Renewable Energy Target Review Final Report 03.2013. Yuin Bangguri (Mountain) Parks: draft plan of management Biamanga and Gulaga National Parks. Public consultation due 12.04.2013. OEH. Will you help save the Environmental Defenders' Office? New Economic Incentives for the Protection of Carbon-Rich State Forests. National Environmental Law Review. Mike Thompson, NatureNet. Issue 2011:3. Logging Bermagui forest: the northern gateway to Bermagui and to the Coastal Wilderness region of South East Australia. Public Forum: Forests, Climate and Woodchips: The Burning Issue, held at Twyford Hall, Merimbula on 01.09.2009. Summary of Walter Jehne's talk. Biodiversity Summit 2009: Biodiversity for Climate Protection. Organised by Lawyers for Forests and the Green Institute. 09.2009. 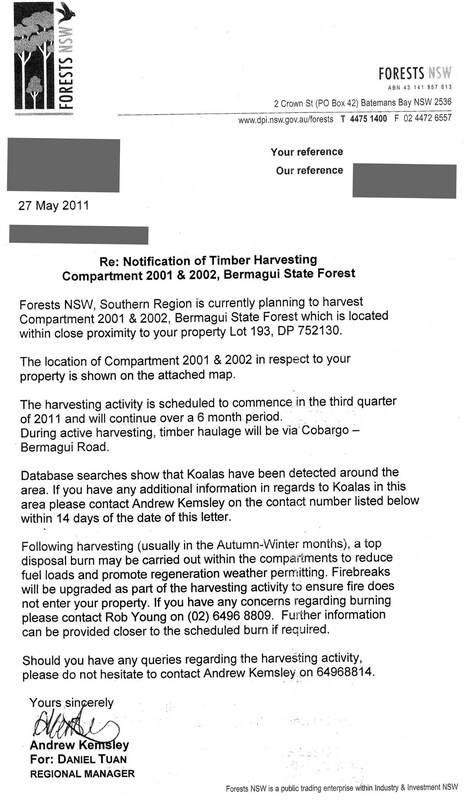 Prescribed burns are prejudging the bushfire inquiry: Crikey email news, 04.09. Transcript: of Fran Kelly interviewing Penny Wong, ABC Radio National. 23.03.2009.. Climate Change, Carbon Pollution Reduction Scheme, Nation Building and Jobs Plan, Household Energy Efficiency Measures. Report on the Moruya Forest and Climate Change Forum. CWA Hall. 29.11.2008. Public Forums on the Role of Forests in Climate Change. Variety definitions of waste wood clouds the issue of electricity production for native forest biomass. contact@serca.org.au | PO Box 724 Narooma NSW 2546 AUSTRALIA.